$20: I, like the article's author, have not used a security camera, but there was a past thread on this forum where there was interest in finding the right such camera, and this $20 Wyzecam sounds like a deal. This"Free" deal barely qualifies for this thread, but "Sling TV" will let you watch 6 hours of free TV over two days with no CC or questions asked.It can only be watched on the Chrome browser on laptops and PC. Well, it's free. Isamorph wrote: This"Free" deal barely qualifies for this thread, but "Sling TV" will let you watch 6 hours of free TV over two days with no CC or questions asked.It can only be watched on the Chrome browser on laptops and PC. Well, it's free. Looks like a nice opportunity to "tippy toe" into the shallow end of Sling without any commitment, a bit like the occasional Sirius XM free trial offers. If you ask me, this would also be a great idea for "Logan's Frugal Tip of the Day" thread! 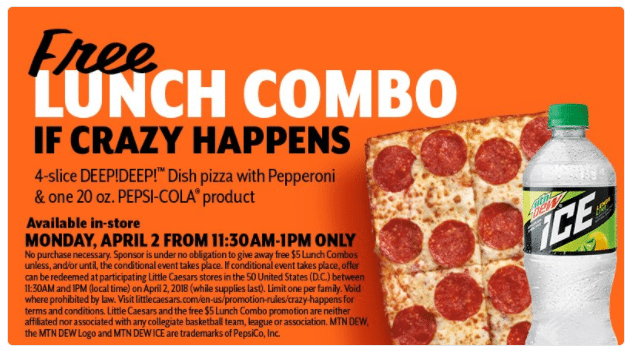 A possibly and quite literally "hot deal" from Little Caesars . I will not be able to take advantage of this, but hope someone can. Toys "R" Us is supposedly slashing prices on Apple products---$75 for a $150 Apple TV device. This could make for some good deals, but given some of my past experiences with close out or liquidation sale, this might best be taken with a grain of salt. Might be worth a look, though, for those seeking Apple products. Is this a good deal? Hot spot with cloud sim and dual sim slots--and unlocked. $175 for a rugged S7.